Beautiful, clean, perfect location, awesome restaurant and bar. Staff is very professional and courteous. I would highly recommend this hotel to my family and friends! Nice lobby bar and downtown location. Great Spanish restaurant about a block away with live music, tapas and sangria. Location - we were able to walk to a terrific Spanish restaurant a block away. Hotel has no parking - need to use city parking garage or metered parking across the street which are free on weekends. Excellent experience would recommend to anyone. Cleanliness and location of hotel. Hyatt Regency Tampa makes a great jump off point for excursions around town and visiting major attractions. The hotel is located in business district and just minutes away from a great variety of dining, entertainment and lots of shopping such as Channelside mall. A short drive away are fun places such as Ybor city which has various major stores and not far from there is the historic Latin Quarter . You could also drive down to the beach and choose from one of the many aquatic opportunities such as parasailing and fishing. The hotel has a fully equipped fitness center for guests who wish to work out and a rooftop sundeck to work on their color. The hotel has 521 guestrooms spread throughout the 17 story building. The rooms come standard with Sealy Posturepedic mattresses, down blankets and a variety of European pillows. Internet is provided, but for wireless there is a fee. After a long day, you can lay back and watch cable and satellite TV with premium channels and pay per view movies. Also included in each room, there are an in-room safe for valuables, desk voice mail and 2 multi-line phones. The hotel features a pool, spa tub and a sundeck on the roof. The fitness center comes fully equipped and has cross-trainers with TVs. The hotels on site restaurant is called Avanzare and features Italian cuisine and a traditional American breakfast as well as Starbucks coffee. Business travelers should take advantage of the business center which has computers with high speed internet access for a surcharge. If short of cash, hit the ATM banking machine. Foreign travelers will appreciate the currency exchange services on the premises. The front desk people are very helpful and knowledgeable. Breakfast is delicious. You have to pay for parking and internet. The rooftop set up creates a relaxing atmosphere. 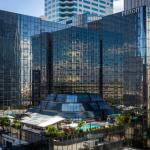 The hotel is centrally located in downtown Tampa . The rooms are well furnished, but relatively average looking. The Starbucks is great for a quick delicious drink. Parking: Yes, there is parking. Valet parking: $16 per 24-hours and self parking is $10 per 24-hours.